Holy Superhero Comic Book Spectaculars, Batman! It was a Superhero Comic Book Spectacular! The 2 Count Value Pack! And it was the ultra-rare (one presumes) Super Hero & Super Villain Edition! Plus there was 1 Free Bonus Super Hero Trading Card In Every Bag! 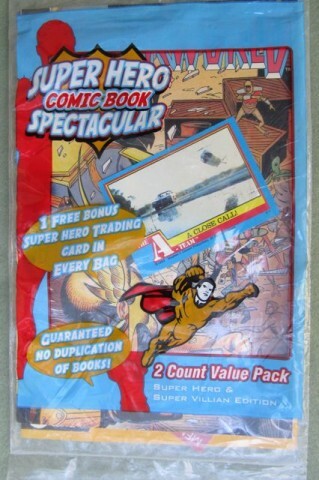 Comic Books, a Trading Card, Guaranteed NO Duplication, Super Fun and Bring Excitement – all for a buck?! Why, I’d have been a fool to pass this up. I bought it! And while I love the whole package – the Free Bonus Superhero Trading Card, the Super Fun, the Bring Excitement, and all the rest – I think it’s that extra effort that the good people at Cards One (the distributor) made to guarantee no duplication of comic books – among a veritable grab bag of two comic books – that I really appreciated. And it’s definitely part of the “Super Fun to bring the whole family together” – indeed, this Saturday, the entire family Parsnips will be piling into the car and heading back to that Dollar Tree to tear apart that goddamn book section again until we find Superhero Comic Book Spectacular 2 Count Value Packs with “Hawkworld” issues 1 through 6 and 8 through 32, and “The New Wave” issues 1, 2, 3, and 5 through 13. And if we don’t find them there, I know of three other Dollar Trees in the area! By the way, if anyone has any A-Team trading card duplicates to swap, let me know. I don’t need #57 (“A Close Call!”). Posted by Ted on August 17, 2011, 9:00 AM.